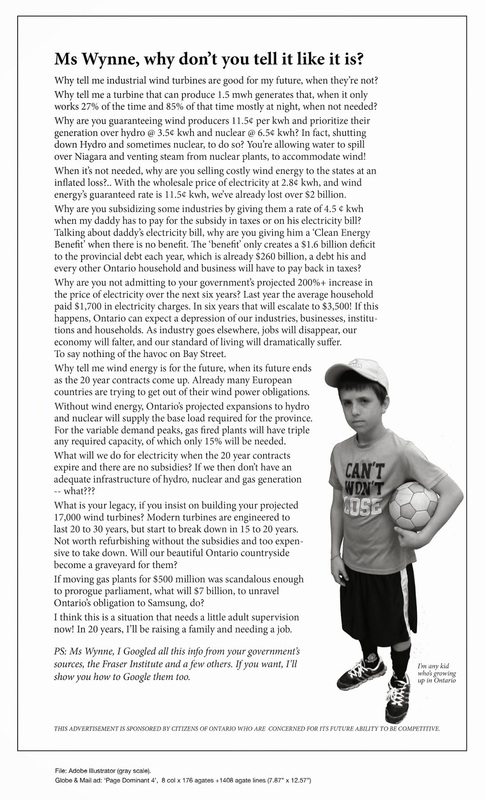 Turbine groups seek township money | Mothers Against Wind Turbines Inc.
It’s a big ask, but members of the West Lincoln Glanbrook Wind Action Group Inc. and Mothers Against Wind Turbines Inc. are optimistic. The anti-turbine groups were among a number of clubs, organizations and charities that applied for funding through the township’s corporate sponsorship fund. The fund doles out money to non-profit groups that serve West Lincoln. In a presentation to council Mike Jankowski and Bonnie Tuson outlined costs that the groups expect to face in 2015, including $30,000 for each group as part of a challenge launched under the Canadian Charter of Rights and Freedoms, $50,000 as part of the Niagara Region Wind Corporation’s judicial review, and $20,000 for community outreach and support. “We are asking for financial support to benefit the efforts of and for the communities of West Lincoln to protect the health and security of all,” they said in their presentation. The township has budgeted $12,500 for corporate sponsorships in 2015. Last year groups such as the PoultryFest committee ($5,000), Big Brothers Big Sisters ($1,000) and West Niagara Agricultural Society ($1,750) received grants from the township. But township staff said such sponsorship for WLGWAG or MAWT was against municipal policy. As a result, the groups were left off the funding list for 2015. But that’s good news for the groups, members say. “It was warmly received by council,” said WLGWAG secretary Anne Fairfield, adding the groups didn’t want to be considered under the corporate sponsorship budget anyway, which would have taken money away from other smaller groups. Councillors Joann Chechalk and Dave Bylsma moved that the funding request be considered as part of the overall budget. “This is likely a better way as we can listen to the people and consider any assistance without worrying about taking away from other small community groups,” Chechalk said, in a letter to the groups. In the letter, she also cautioned that the upcoming budget is expected to be a tight one. Fairfield said the community has supported the groups up until now, but that’s no longer feasible. “The community is tapped out,” she said. In addition what she called a warm reception from council, Fairfield said the groups are optimistic they’ll receive funding based on what has happened in Lambton and Bluewater counties. Those municipalities have both provided dollars to oppose turbine projects. Lambton County recently added another $20,000 in funding, bringing its total spent fighting turbine projects up to $80,000. “We wouldn’t have gone ahead if we hadn’t been assured council was sympathetic,” she said. The township will be holding an open house on March 11, where it will consider budget requests for 2015. No decisions will be made that day but Fairfield said both groups expect to be on hand to plead their case.